1. Put the bulgur wheat in a bowl and pour over boiling water to cover. Place clingfilm over the top and stand for 10 minutes until tender. Drain off any excess water. 2. Put the lamb in a food processor with the onion and garlic. Add the ground and fresh coriander, and the harissa paste. Season. Whizz for 30 seconds until well blended. Mix in the cooked bulgur wheat. 3. Preheat the grill. Divide the mixture evenly into 8 ovals and press each around a metal skewer to form a 15cm kofta, pressing together well. Put the koftas under the grill and cook for 7-8 minutes until browned, then turn over and grill for a further 7-8 minutes until thoroughly cooked through. 4. To make the salad, halve the cucumber lengthways and remove the seeds with a teaspoon. Slice the cucumber and place in a large serving bowl with the remaining salad ingredients. Season and toss together well. 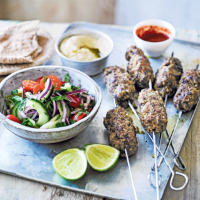 Serve in the warmed pittas, with the houmous, extra harissa and the koftas.